“Wake Up! Sign Up! Look UP! was the beginning of an advertisement, fostered by President Eisenhower in 1953 encouraging communities to become part of the U.S. Air Force Ground Observation Corps. Fashioned after a similar organization in WWII, this reformed Corps was to counter the threat of an atomic bomb being dropped by the Soviet Union during the very tense Cold War. 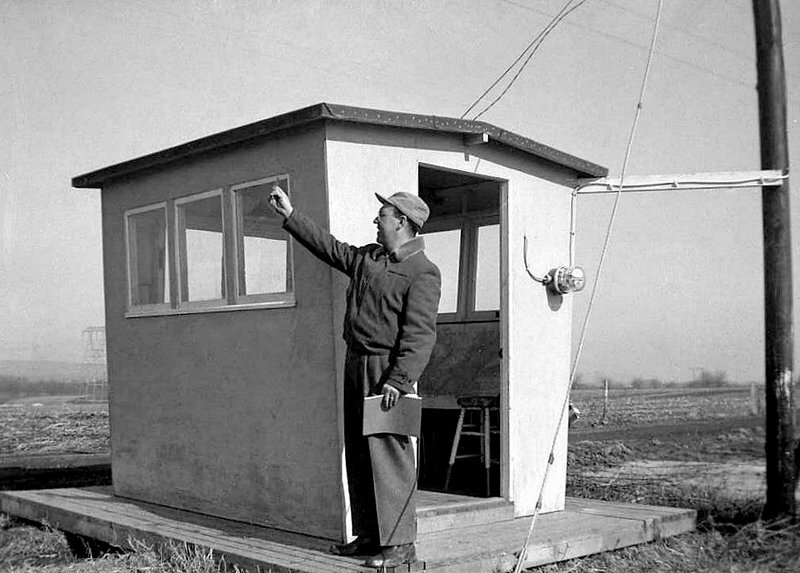 In the GOC, civilian volunteers were encouraged to build watchtowers in backyards and community centers, and to survey skies for aircraft. Utilizing a telephone, binoculars, observation manuals and a log book, civilians searched the skies for airplanes flying lower than 6,000 feet, which could evade radar detection. At the sight of a suspicious, possibly nuclear-bomb-toting plane, civilians were to telephone their local filter center staffed with Air Force personnel, who could then direct the plane to be intercepted or shot down. Ringoes, Flemington and Lambertville all had GOC watch towers. In Ringoes, the Rev. Horsfield, pastor of the Kirkpatrick Presbyterian Church led the Ringoes contingent as their superintendent, first with an observation area behind the Presbyterian manse but later in 1954 with a dedicated building on the south side of Rt.604 on a hill at Chris Stahl’s farm. The township paid for the building and its electricity and many local boys participated as observers, including a young Will Harrison. Harrison recently recounted how when someone identified a plane they were to call it in to the local White Plains Field Office. Unfortunately the phone they had was on a 10 party line so they would say “Interrupt this line for an aircraft flash” and everyone on the line was expected to immediately hang up. Later a dedicated loop line was put in that had Flemington, Lambertville and Ringoes on it. The dispatcher would crank the line and then identify that they were from Ringoes using their special code: Alpha-Lima-Zero-Two-Red. The caller would include the planes altitude and direction and whether it was a jet (rare), a one or multi-engine prop plane, blimp or helicopter. In 1952 there were approximately 750,000 observers nationwide at 16,000 observation posts. Made up of families, prisoners and guards, youth and the elderly and naval and USAF personnel, they watched the skies 24 hours a day in what became known as Operation Skywatch. On January 31, 1959, the Secretary of the Air Force announced the termination of the program due to the improvement of radar detection. The Ringoes operation closed down….and the building? It was dragged to John Ringo Rd. and added onto an existing house. It is still there.